A comic musical revue about all aspects of death, leaving no gravestone unturned. Aaron is the project’s creative director as well as one of over a dozen composers, lyricists, and book writers involved in the project from NY, LA, Chicago, and Houston. 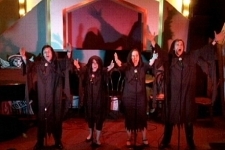 DEATH, THE MUSICAL received a tryout production in Houston on October 6-31, 2011 from Thunderclap Productions.